After declaring 43 industrial areas in India as critically polluted and imposing a moratorium on their expansion, the Union Ministry of Environment and Forests is going easy on them. As many as 23 critically polluted areas have been removed from the moratorium list since last October on the basis of inadequate action plans submitted by the respective states. Non-profit Centre for Science and Environment evaluated the pollution status of two such places—Vapi in Gujarat and Cuddalore in Tamil Nadu. It found that pollution in these chemical hubs continues to exceed norms, putting a question mark on the ministry’s intent to tackle pollution. An analysis of pollution data by Sanjeev Kumar Kanchan. Ankur Paliwal reports from Vapi and Sumana Narayanan from Cuddalore. Over a year ago, the Union Ministry of Environment and Forests (MoEF) undertook an exercise to assess pollution levels in some of the highly polluted industrial areas of India. It then released a list of 43 most polluted areas, terming them critically polluted, and imposed a moratorium on their expansion. The aim of the whole effort was to identify areas that required urgent intervention and pollution abatement measures. The exercise proved futile as these areas remain highly polluted and have brought no change in the lives of people living near them. Take the case of 32-year-old Kisna, a fisher in the Daman district of Daman and Diu on the west coast of India. His source of living is threatened by pollution from nearby Vapi—the chemical hub of India in south Gujarat’s Valsad district. Vapi’s industries have severely polluted the Daman Ganga river, which is the lifeline of the fishers. The exercise to identify critically polluted areas in India was undertaken for the first time in May 1989 in a meeting of chairpersons and member secretaries of the Central and state pollution control boards. At that time 24 critically polluted areas were identified, including Vapi, Ankleshwar and Ludhiana. It was then decided that a comprehensive, time-bound programme would be evolved for these areas. Several review meetings followed but there was no improvement in the 24 industrial hubs. In 2009, CPCB collaborated with IIT Delhi and other institutes to evolve a new evaluation method and rank polluted areas—the Comprehensive Environmental Pollution Index (CEPI). Kisna was once prosperous. He earned up to Rs 3,000 a day from the 10-12 kg of lobsters he used to catch from the river’s estuary. Now he has to travel up to 8 km into the Arabian sea and manages to catch just two to three kilogrammes of fish a day. He cannot go further because his boat is small; fishers with bigger boats have to travel beyond 22 km to get a good catch. Kisna’s earning has dwindled to Rs 600, most of which is spent on maintaining his boat and nets. Kisna’s biggest fear now is that he may end up working in one of the factories that took away his means of living. “If the catch keeps declining like this, I may end up working as a daily wager in Vapi,” he says, untangling his fishnet and showing his meagre catch. “I have heard they pay just Rs 100 to Rs 150 for 12 hours of work,” says Ganesh, another fisher. About 1,500 fishers in Daman share the fate of Kisna and Ganesh. Daman’s fisheries department confirms what the fishers say; fish catch in the area has reduced 50 per cent in the past decade. In India’s east coast, people living near Cuddalore town in Tamil Nadu are facing a similar problem. The river Uppanar that flows through the area was used extensively for inland fisheries once. “When I was younger, fish were plentiful. Now we get only small fish; they don’t fetch much in the market,” says V Bhoopathy, a fisher from village Sangolikuppam. 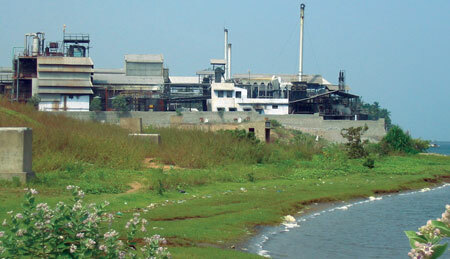 Cuddalore town has over 20 polluting industries. Their effluents are carried through a 2 km pipeline in the riverbed and discharged in the sea. Fishers say they can tell when highly polluting effluents are being discharged from the rising bubbles and the change in the colour of water. 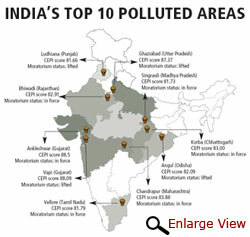 Both Vapi and Cuddalore figure prominently in the list of critically polluted areas released by MoEF in January 2010. Critically polluted areas are those where air, water and land pollution exceed the assimilative capacity of the environment, affecting human health. The exercise to identify such areas has been on since 1989 (see ‘First list released 23 years ago’ and ‘Timeline’). But it was based mostly on the observation data of state pollution control boards (SPCBs). This changed in 2009 when the Central Pollution Control Board (CPCB), in collaboration with IIT-Delhi and experts from premier environment institutes, devised a scientific method to evaluate and rank polluted areas. It is called the Comprehensive Environmental Pollution Index (CEPI). The index was used to assess 88 industrial clusters in the country (see ‘Measure of pollution’, Down To Earth, January 15-31, 2010). CPCB chose these clusters after asking state governments to forward a list of polluted areas on the basis of pollution data. CPCB also monitored pollution in these clusters before finalising the list. All the 88 areas have highly polluting industries, which include power plants, mining areas and chemical, pharma and dye factories. For CEPI evaluation of the clusters, data on land, water, air pollution, ecological damage and waste management in these areas was taken into account. The industrial clusters were ranked on a scale of 0-100. A high score indicated high levels of pollution and environmental degradation. After the evaluation, 43 areas which scored 70 points and above were declared critically polluted (see ‘Pollution score card’ on left). Vapi’s score was 88.09, next to Ankleshwar, ranked first with a pollution index of 88.5 points. Cuddalore scored 77.45 and was ranked 16th (see ‘India’s top 10 polluted areas’). Activists and some of the state governments have, however, been critical of the evaluation. Delhi non-profit Centre for Science and Environment (CSE), which analysed the CEPI evaluation found that areas where mining is rampant, like Bellary in Karnataka and Jharia in Jharkhand, were not even assessed. The evaluations had other shortcomings—SPCBs do not have adequate database and there is no transparency in data collection and tabulation of affected population. What followed the release of the list came as a shock for those campaigning against pollution near industrial areas. At the time of announcing the list of critically polluted areas, MoEF had put a ban on expanding existing industries or setting up new ones in these areas. The ministry also asked the respective SPCBs to submit mitigation action plans for these areas in eight months. All plans were submitted by October, 2010. But before any significant change in pollution levels could be seen on the ground, the ministry lifted the moratorium on Vapi and four other critically polluted areas in October. Eighteen more areas were taken off the moratorium list between February and May this year. The ministry justified the decision, saying it was based on initiation of works mentioned in the mitigation action plans submitted by states. “The purpose of the moratorium was to sensitise the state governments and identifying the problem. The moratorium was lifted only after a review of the action plans,” says R S Cori, scientist with CPCB, who was closely involved in the CEPI study. While accepting that many of the areas where moratorium was lifted are not meeting norms, Cori says reduction of pollution levels is a long process and results cannot be seen overnight. Besides, there were other concerns—industry associations objected that the moratorium was affecting their growth and that they were being unfairly punished because of some polluting units in their areas. CPCB has formed a steering committee, which meets every two months to review pollution reduction. Lifting the moratorium was not justified. How can it be lifted on the basis of some paper work without analysing the ground situation, which has not changed? Environmentalists criticised the ministry’s decision. “Lifting the moratorium was unjustified. How can it be lifted just on the basis of some projections on paper without analysing the ground situation, which has not changed?” asks Michael Mazgaonkar of non-profit Paryavaran Suraksha Samiti that works in Gujarat. A K Nema, professor at IIT-Delhi, says if an area is already choked with pollution, allowing new industries can have serious impact on the environment and human health. “I think the ministry should consider re-imposing the moratorium in these areas, else the whole purpose will be defeated,” says Nema who was involved in the CEPI evaluation. Questions have also been raised over the efficacy of the mitigation action plans of the states. CSE analysed two of the critically polluted areas—Vapi and Cuddalore. Vapi was chosen because it is second in the list of critically polluted areas after Ankleshwar. While the moratorium in Ankleshwar is still in force, the one on Vapi was lifted. Cuddalore was randomly selected from the list of areas where moratorium was lifted. The CSE analysis shows pollution levels in the two areas are still way above the permissible limit. The Gujarat Industrial Development Corporation estate of Vapi has a total of 832 industries of which around 759 are polluting ones. Of them, 653 are in the red- category list of CPCB. Seventy per cent of the 759 factories include those making dyes, dye intermediates, pesticides, chemicals and pharmaceuticals. The remaining are mostly paper mills, plastics and food processing units. The water pollutants from these industries include ammoniacal nitrogen, phenolic compounds, benzene, pesticides, heavy metals, cyanide, arsenic and organic as well as inorganic pollutants. Prolonged exposure to these can prove fatal. In its mitigation action plan, Gujarat PCB mentioned some works initiated to bring down the levels of these pollutants. These include reduction of pollutant load on Vapi’s Common Effluent Treatment Plant (CETP) and its capacity upgrade because effluents entering and leaving the plant were not meeting the prescribed norms. In November last year, the Vapi Waste and Effluent Management Company (VWEMCL), managed by the industry association, upgraded the capacity of the CETP from 55 million litres a day (MLD) to 70 MLD. But this may soon prove inadequate as effluent reaching the CETP is increasing every year. It was 48 MLD in 2009; it is 60 MLD now. VWEMCL has also installed a Fenton (a reagent) Activated Catalytic Carbon Oxidation plant to oxidise wastewater having pollutants that do not break down easily. Such pollutants use up more dissolved oxygen in the water and are a threat to the fish. Other measures initiated under the mitigation action plan include installation of flow meters by every industrial unit to regulate effluent discharge to the CETP, and checking of illegal discharge of highly polluted effluents in open areas. But these measures have only marginally improved the effluent quality discharged into the Daman Ganga river; the pollution levels still exceed the norms. 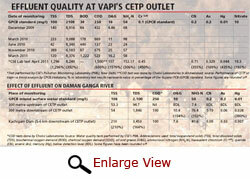 For example, CPCB’s periodical monitoring data shows the chemical oxygen demand (COD, measure of oxygen depletion in water caused by organic pollutants during decomposition) of the effluent discharge at the Vapi CETP outlet is 500-800 mg/litre; the maximum permissible limit for it is 250 mg/l. CSE’s Pollution Monitoring Laboratory tests found that COD level in the effluent at the CETP outlet was 1,500 mg/l, which is 600 per cent of the norm (see table: ‘Effluent quality at Vapi’s CETP outlet’). The tests conducted in April 2011 also show presence of heavy metals like mercury and poisonous compounds like arsenic and cyanide. CSE also collected water samples 300 metres upstream and 300 metres downstream of the CETP outfall and five to six kilometres downstream of CETP at Kachigam dam (see satellite image p26). The results showed presence of high levels of mercury and oil and grease (see table above). High levels of organochlorine and organophosphorous pesticides were also detected. Vapi’s waste management utility, however, claims there is improvement in the effluent quality. For instance, COD level of treated wastewater has been reduced to 500-800 mg/l in 2010-2011 from 800-1200 mg/l in 2004-2009, says D C Sharma, chief executive officer of VWEMCL. 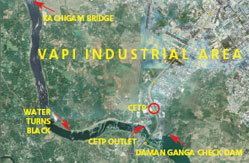 “Vapi mostly has small industries. It is difficult for them to manage CETP inlet norms as most of them do not have high-end technology. When inlet norms are not met, water with high COD levels flows out of the CETP,” says Sharma. He adds that very soon the CETP will bring COD levels further down to 350-400 mg/l by upgrading effluent treatment plants of each industrial unit. Industry owners have, meanwhile, demanded that pollution standards should be relaxed for chemical industries. “We are doing our best. If CPCB has a magic formula for reducing pollution and COD levels give it to us,” says Mahesh Pandya, former president of the Vapi Industrial Association. Vapi’s waste management utility has a solution, as mentioned in the action plan. It has collaborated with the National Institute of Oceanography and has proposed a 22 km-long under-sea pipeline that will carry the treated effluent from the CETP and discharge it deep in the sea. “The effluents will be widely dispersed and we can achieve 100 per cent dilution of effluent this way,” says Sharma. 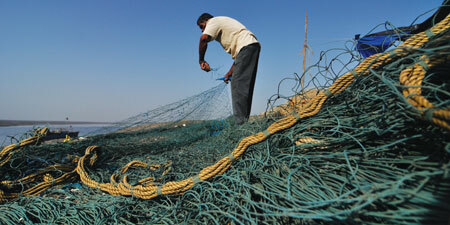 Fishermen in Daman oppose the proposal. “We have already lost the fish in the estuary because of the toxic discharge into the river. 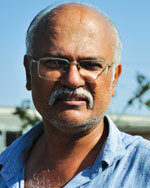 The pipeline will kill the fish in the sea,” says Premabhai S Prabhakar, a leader of the fisher community. The action plan misses some important measures. CSE analysis shows Gujarat PCB’s action plan makes no mention of any review study of existing surface water quality and its impact on people and ecology. It does not provide for any impact assessment study on fish due to discharge of polluted water into the sea. The plan does propose reverse osmosis (RO) technology for treating non-biodegradable effluent, but it has not been implemented yet. The review studies and installation of RO technology are vital for pollution abatement. The mitigation action plan also gives a miss to the contaminated groundwater in and around Vapi. In 2005, a Supreme Court monitoring committee had ordered the Gujarat government to seal all contaminated wells and borewells and make drinking and irrigation water available to people. The committee identified indiscriminate dumping of hazardous waste in the open as the source of contamination. 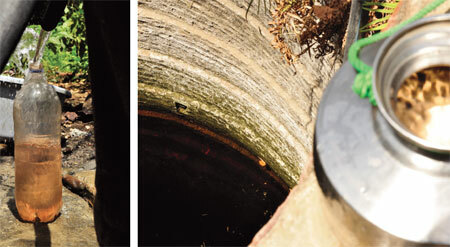 The state authorities sealed many borewells, but are yet to make drinking water available to all. Water for agriculture is yet to be arranged. Vapi’s waste management company removed 10,000 tonnes of hazardous waste from the illegal dumping sites to the hazardous waste treatment facility in Vapi in November last year, but no action has been taken to decontaminate the water. A visit to three affected villages revealed many people are still drinking the contaminated groundwater. Rata village near phase III of the industrial estate has around 1,100 families, but only 200 of them have easy access to safe drinking water. “The rest are either forced to drink the contaminated water or walk at least one km to reach the nearest drinking water source,” says Jayendra Bhai Patel, sarpanch of Rata. CSE collected water samples from two places—Vathiavad and Desaivad localities in Rata village, and from Dungrifalia and Gala Masala villages along the Dharampur road in Vapi. The tests showed pesticides in concentrations exceeding bottled drinking water standards prescribed by the Bureau of Indian Standards (see table above). Pollutants, including iron, dissolved solids and mercury, were also detected. To get rid of the solid waste, the Vapi administration has proposed a co-processing plant where plastic waste would be burnt in cement and steel plants. “But the industry waste is sometimes still found dumped at several illegal places like Bill Khadi, a rivulet,” says Rohit Prajapati, a Vadodara-based environmental activist. Sharma says VWEMCL has constructed a barrage to divert Bill Khadi’s water to CETP. Pollution in Vapi’s air is palpable. “In winters, we have to stay indoor because the air becomes suffocating and the eyes start itching,” says Devli Ben of Vathiavad in Rata village. The Gujarat PCB is responsible for monitoring air pollution, but it does not have monitoring facilities for pollutants like volatile organic compounds (VOCs), polycyclic aromatic hydrocarbons (PAHs), polychlorinated biphenyls and vinyl chloride, released by industries. Many of these pollutants are carcinogenic and released by chemicals, dyes, paints, pharmaceuticals and other industries using organic chemicals. For monitoring VOCs, CPCB has given the contract to Vadodara-based Gujarat Environment Management Institute. Monitoring of PAHs, polychlorinated biphenyls and vinyl chlorides has been outsourced to a private firm. An official of the environment institute admits that the levels of VOCs, arsenic, nickel and ammonia exceed standards. Gujarat PCB only monitors sulphur dioxide (SO2), nitrogen dioxide (NO2), respirable suspended particulate matter (RSPM) and suspended particulate matter (SPM). Air pollution monitoring data of the PCB shows that while SO2 and NO2 meet the permissible standards, RSPM levels hover in the range of 70-120 µg/m3 against the standard of 80 and SPM in the range of 150-200 µg/m3 against the standard of 100. Gujarat PCB says there is 80 per cent improvement in the ambient air quality over the past two years, but its mitigation action plan does not have clear cut proposals. It merely mentions “proper air pollution control measures, adoption of cleaner fuels, plantation and cleaner technology” as some of the broad areas, for which a five-year deadline has been set. G V Patel, regional officer, Gujarat PCB says all industries in Vapi have air pollution control equipment, and “we keep taking disciplinary action against them”. But he refused to reveal the names of three factories that were issued closure notices recently. After the submission of the mitigation action plan, around 200 industries have converted to natural gas, others are still using fuel oil. CSE analysis of the action plan shows Vapi failed to give a clear plan on lowering levels of VOCs, benzene, PAHs and polychlorinated biphenyls, which is required urgently. Though the government and industry association have taken some measures to curb pollution, a lot still remains to be done. “If the government seriously cares about improvement in Vapi, it should re-impose the moratorium and not lift it till all parameters are met,” says Prajapati. CSE also evaluated PCB claims that the mitigation action plan will reduce Vapi’s pollution index to 61.88 (severely polluted). It found that even if one goes by SPCB’s claim that air quality has improved and the affected population is less than 100,000, the CEPI index for air would reduce from 74 to 67 and not 39 as projected (see table above). The plan also ignores the impact of pollutants on health and ecology, despite visible water pollution. By skipping these vital factors, the indices for water and land were lowered to 56.25 and 33. CSE analysis shows even if all the measures mentioned in the action plan are factored in, Vapi’s CEPI score will reduce to 84 (critical), not 61.88 points. This means Vapi will remain a critically polluted area as it has been for the past 23 years. On the night of March 7, a thick pall of smoke enveloped Kudikadu village near Cuddalore. It made people ill; over 120 persons had to be hospitalised after they complained of nausea, giddiness and eye irritation. The white smoke was bromine gas and its source: pharma company Shasun Pharmaceuticals, which abuts the village. The mishap underscored the perils of living near a chemical industrial hub like Cuddalore. What was more significant was that the incident happened within a month of MoEF lifting its moratorium on expanding or setting up new factories in the town’s SIPCOT (State Industries Promotion Corporation of Tamil Nadu) industrial estate. As in the case of Vapi, the moratorium on Cuddalore was imposed in January 2010. The reason for lifting the moratorium was the initiation of works mentioned in the mitigation action plan the Tamil Nadu PCB submitted to MoEF. The action plan makes it appear that pollution in Cuddalore is well under control, the industries are abiding by the norms, and there is no illegal discharge of pollutants. 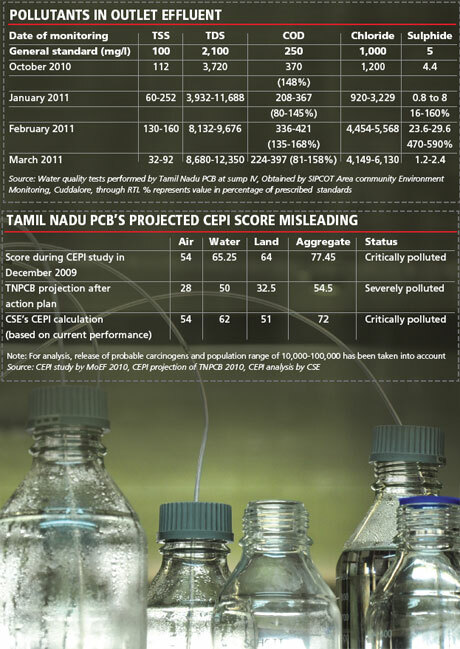 The effluent monitoring data of PCB belies the claims. It shows high levels of pollutants in the effluents even at the time when the moratorium was lifted (see ‘Pollutants in outlet effluent’). The data was accessed by the SIPCOT Area Community Environmental Monitoring (SACEM), a community initiative to track pollution in Cuddalore, through Right To Information. The data shows the chemical oxygen demand (COD) and chloride level in effluent were beyond permissible limit. The industrial estate, spread over 1,080 hectares, has 31 units. Of these, 20 generate effluents, 10 claim to be zero-discharge units, where no liquid waste leaves the premises. The remaining treat the effluent before sending it to the Cuddalore SIPCOT Industries Common Utilities (CUSECS). The utility managed by industries does not treat the effluent but merely mixes the treated effluent of member units, stabilises it at pH 7-7.5, and then releases it in the Bay of Bengal. 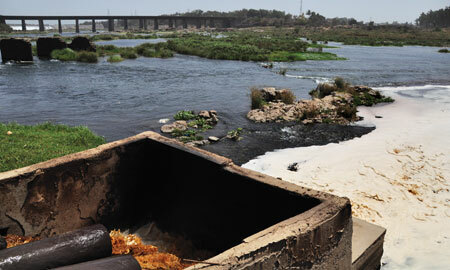 SACEM says the industries often illegally discharge untreated effluents into the river. “Of course when the industries get information of an official visit, they stop illegal discharges. But we have documented 15 incidents of illegal discharge of effluents between 2004 and 2009,” says Arul Selvam of SACEM. Shweta Narayan, coordinator with SACEM, says the waste utility has till date been issued five show cause notices by SPCB for flouting pollution norms. Media reports of SACEM’s findings led to the Madras High Court taking suo moto cognisance against industries. The case is still pending. K Indra Kumar, secretary of Cuddalore SIPCOT industries association says all the effluent treatment plants of industries are performing well. Kumar says measures like zero liquid discharge and use of anaerobic digesters (where microbes are used to treat waste water in the absence of oxygen), for which trial runs were held in February, showed remarkable results. As for the solid and hazardous waste, it is sent to a waste treatment facility in Gummidipoondi in Thiruvallur district, says Kumar. People living in the surrounding area, however, say some of the closed units (there are 23 of them) have stored the waste within the premises. 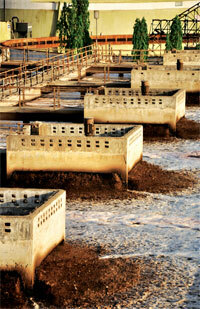 The waste includes chemical sludge, sludge from electrolytic cells, metal plating sludge and polyvinyl chloride lumps. 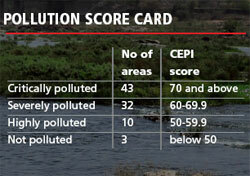 In the CEPI list released last January, Cuddalore scored 77.45 points (air: 54, water: 65.25, and land: 64). SPCB’s mitigation action plan says with the pollution abatement measures it has proposed, the index score will fall to 54.5. A PCB official says the pollution control measures needed were minor such as filters and anaerobic digesters which the industries have installed. He offered no comments when asked to explain how such small changes could reduce pollution drastically and why these measures were not introduced earlier. CSE’s analysis shows that the projection in PCB’s mitigation action plan is misleading. Calculations show the aggregate CEPI score may reduce to 72, not 54.5 points as projected by the PCB (see table ‘Tamil Nadu PCB’s projected CEPI score misleading’). This is because like in the case of Vapi, the Cuddalore CEPI evaluation also gives a miss to important factors like presence of major air pollutants (benzene, volcanic organic compounds or VOCs), visible impact of pollution on groundwater and surface water and their impact on people; an estimated 20 villages are affected. An investigation by the National Environmental Engineering Research Institute in January 2011 found Cuddalore’s industries release nearly 28 types of VOCs which are classified as hazardous. The action plan is also silent on the impact of new industries coming up in SIPCOT phase III. This area will have the Nagarjuna refinery and a textile park with 15 processing units. The refinery under construction will have a captive jetty as well. “This site is hardly 10 km from Pichavaram, a mangrove-rich, eco-sensitive region. The government is not looking at the cumulative impact of these industries on the region,”says S Ramanathan, monitor with SACEM. The industries have already contaminated groundwater used in irrigation; drinking water is also scarce as there is no municipal water supply. “Our fields are dry and look at the trees,” says Kuppu Raj, chief of Kudikadu village, while pointing at some shrivelled coconut trees. The going may become tougher once the new industries become operational. The CSE study proves that MoEF was in a hurry to remove the critically polluted tag of Vapi and Cuddalore. Instead of applying a strict monitoring regime to assess pollution, it relied on promises made on paper to lift the moratorium. The ministry, in fact, threw caution to the wind—it did not even carefully assess the projections made by SPCBs that would have nailed the lies in the mitigation action plans. MoEF is also guilty of not establishing benchmarks that should be achieved in a time-bound manner before the moratorium on critically polluted areas could be lifted. The ministry should demand comprehensive action plans from states, which should factor in all relevant aspects. In addition, the CEPI evaluation should be made a continuous process wherein the ranking of industrial areas is updated every two years, and all the related information should be made public. MoEF also does not seem to believe in the principle that polluters should pay. A tax or a monetary penalty on polluting industries would have a deterrent effect, and the money so collected can be utilised for pollution abatement. The moratorium was like a ray of hope for the industrial areas choking on pollution, but only a brief one. Many congratulations to Sanjeev Kumar Kanchan , Ankur Paliwal, Sumana Narayanan for bringing this to our notice. Hope Union Ministry of Environment and Forests will do something on it. As a true citizen we also should not dump all garbage's to river or sea just like this. At the end of the day it WE who are going to affect and suffer from all this. In order to maintain Eco-system we must support the cause. Hope Govt will take strict action against those industries who violating the rule with the passing their chemicals directly to Sea or river. Its impossible to drink contaminated groundwater but Rata villagers are drinking contaminated groundwater. When India Fight Against Corruption.. if you all study more on it.. you will find it out that this is another form of corruption. Our great politicians silently takes money from these industrialists and send them to Swiss Bank for which we are all fighting. That's called Black Money. Until n unless corruption does not stop from politician's end.. we won't find any solution. There is no indication from CPCB's website that any of the requisite pollution mitigation action plans prepared by the relevant state pollution control boards have been made public. Of the remaining approximately five cluster areas remaining under moritoria, Korba in Chhattisgarh concerns polluting coal burning power stations, chemical plants and aluminium smelters. Have any RTI applications in respect of the Chhattisgarh CPB mitigation action plan for Korba been made successfully? The report states that Ã”Ã‡Â£Central Pollution Control Board [CPCB] has evolved a comprehensive environmental pollution index (CEPI) for 88 study areas with an objective of identifying polluted clusters or areas in order to take concerted action and to centrally monitor them at the national level to improve the current status of their environmental components such as air and water quality, ecological damage and visual environmental conditions. As per the study of CPCB, the Patancheru-Bollaram was considered as critically polluted area. The steering committee of CPCB, New Delhi on CEPI reviewed the draft Action Plan of Patancheru-Bollaram cluster of Andhra Pradesh state by Andhra Pradesh Pollution Control Board (APPCB) on July, 2010 and gave certain suggestions/ comments. Taking into consideration of the suggestions/comments of steering committee, a revised action plan was prepared by APPCB and submitted to the CPCB. The Ministry of Environment and Forestry Department of Government of India [MoEF/GoI] has reviewed the revised action plan of APPCB for Patancheru-Bollarum areas and subsequently, delisted the same from the critically polluted areas vide MoEF Notification dated 26th October 2010. This shows that while the preparation of final action is under way, MoEF eased the ban notification prohibiting establishment/expansion of certain polluting industries in and around IDAs/IEs including industrial areas located in Patancheru-Bollaram area. Also, the outlet of PETL was connected to 18 km pipe line on July 7, 2009 while the court cases between the industries Ã”Ã‡Ã´ PETL and APPCB are going on. The main factor that contributes the pollution levels in a given area are high TDS and excess production. Here the manipulation takes place including manipulation of zero discharge. In this APPCB has no control. Because of this every other day people report obnoxious odours from these industries as well from CETPs. All these looks like a match fixing between Industries-APPCB-MoEF. A decision was taken in haste without going in to veracity of data and index. Let me present below this in detail. The index was derived based on three factors, namely air, water and land (which include groundwater). According to CPCB study Patancheru-Bollaram area has the index 77.07 where in air index is 50, water index is 59 and land index is 54. This was released in 2009 by CPCB. APPCB submitted action plan in July 2010 in which the index is 47.33 where air index is 47, water index is 38 and land index is 32. In a matter of less than a year the index has come down from 70.07 to 47.33. How it is possible, which is a big question with court cases pending. The answer is the index was manipulated. The CPCB value is 50.0 and APPCB value is 47.0, which means there was no change in the quality of air that includes pollutant concentration, scale of industrial activities, ambient pollutants, evidence of adverse impact concentration, reliable evidence of adverse impact on eco-geological features, population exposed, level of exposure, and additional risk to sensitive receptors. In all these factors practically no difference except in ambient pollutant concentration increased from 1 to 3. From these the score increased by 2, showing a tendency of increased air pollution. But to counter this, APPCB has brought down the index of additional high risk element qualitatively from 10 to 5, showing that there is an improvement in pollution control measures without looking at excess production by industries and evaporation component of high TDS effluents, which counters the above assessment. This is APPCB manipulation. There was sudden drop in the water index from 59 to 38. This includes pollutants category (TDS, Cl, SO4) & industry category with no change; Pollutants level has dropped by reducing the factor 8 to 2 in which symptoms of exposure of people and symptoms of exposure on eco-geological features presenting no change. Same way in the C factor the multiplication factor was reduced from 3 to 1 in which no change in population exposed and risk to sensitive receptors. The D factor which relates to adequacy of common facilities for pollution control was reduced from 10 to 5. These are simple manipulations without taking into account the excess production and evaporation of high TDS Ã”Ã‡Ã´ in fact these are the factors that are contributing illegal dumping of effluents in water bodies, forest areas, drains, etc. APPCB talks of PETL only. presenting results of M/s. PETL from January 2009 to October 2010 that during April 2009 to January 2010 the outlet TDS & COD values are lower than those after January 2010 while Ammonical Nitrogen showed a decreasing trend. Why? If we look at the data on plan of action presented in page nos. 20 to 33, it is clear that the industries have not completed the action plan, which may be achieved only by December 2010. Almost all the industries reports the same by November 2010 as Ã”Ã‡Ã´ R.O. Plant civil works are under progress; proposed to install STP; Proposed to provide online monitoring; taken up R & D study the water conservation practices are being reviewed; proposed to monitor the VOC levels; the industry suggested that APPCB may advise detailed methodology. That means majority of the action plans were not completed and yet Ã”Ã‡Â£reduced the pollutants and improved control measuresÃ”Ã‡Ã˜. After easing the ban notification by MoEF, Minister for Environment and Forests of GoAP in a meeting emphasized the need to double the capacity of CETPs. He said that industries are producing in excess of consented quantity and dumping the effluents illegally in to drains. So, he wants by this way legalize illegal actions of industries that are going in for the past several years. Also, industries shifting highly polluting component of the process to smaller industries as job work. The smaller industries have no pollution treatment facilities and thus dumping the effluents in somewhere illegally. Also, industries are changing product mix overnight and sometimes certain drugs though may be produced in small quantity that has high market value generates huge quantity of effluents both solid and liquid. All these are brought out by SCMC. Industries also dilute the effluents with fresh water to meet the inlet standard of CETPs. In case they are not meeting, CETPs reject the tanker. The tanker in turn dumps the effluents somewhere Ã”Ã‡Ã´ cases are pending on such. This is the common practice. APPCB talks of zero discharge. It is a like ISO certification available for a price. None of the industries have the water balance and material balance data and yet APPCB talks of zero discharge to facilitate illegal dumping of effluents. APPCB is not accounting the amount of effluents discharged in to water bodies, drains, etc. But this is clearly reflected in groundwater data (see below). Thus APPCB qualitatively manipulated the index to show critically polluted areas as not critically polluted areas. There was a sudden drop in the index from 54 to 32 similar to water index. The land includes the groundwater and as a result the factors simply followed as that in the case of water index. The element A is same but in element B, pollutant factor was dropped from 8 to 1 though the groundwater data do not support this. The element C also pollutants was dropped from 3 to 1, a multiplication factor, similar to that of water index. Also follows the same in D drop from 10 to 5. APPCB qualitatively manipulated the index. Let us see the ground water quality in Patancheru/Sultanpur (Tables on pages 47 to 55 during 2001 to 2009 for 19 locations). associated with precipitation patterns in that zone. Basically in the case of water index and land index, APPCB tried to show the reduction in pollution factors (TDS, Cl, SO4) and common facilities for pollution control are adequate showing that they are working effectively, contrary to this was expressed by the Minister, GoAP and media every day. APPCB has not accounted the illegal excess production and what is happening with high TDS effluents, diluting of effluents sent to CETPs -- ground realities support these. APPCB manipulated the computations to achieve the two goals, namely (a) dump the partially treated or diluted effluents with domestic sewage by CETP in to Musi River instead of Nakkavagu Ã”Ã‡Ã´ does not mean the pollution conditions improved; and (b) to ease the ban notification to clear the decks to have more new industries in the area and allow the existing industries to increase the production or legalize the hither to illegally producing quantities. It appears that neither the steering committee of CPCB or CPCB in-house committee nor MoEF has gone into the data nor index submitted by APPCB or ground realities before taking an important decision by MoEF. May be it is due to match fixing between industries-APPCB & MoEF. 1.Bhurelal committee on air pollution Ã”Ã‡Ã´ comes every now and then hob-nob with anti-metro rail project groups and enjoys the hospitality given by APPCB and goes back with little achievement. It is a wasteful expenditure. APPCB in itsÃ”Ã‡Ã– action plan submitted to Supreme Court in 2003 one of the main air pollution causing component mentioned for action is Ã”Ã‡Â£Adulterated fuelÃ”Ã‡Ã˜. The control of adulterated fuel must be achieved by 2004 but still is a major problem. This component of adulterated fuel is going up with fuel prices going up. Do we need Ã”Ã‡Â£Bhurelal committeeÃ”Ã‡Ã˜? The answer is big Ã”Ã‡Â£Ã”Ã‡Ã˜No but we need a mechanism to eradicate adulterated fuel use. MoEF has such wasteful committee to serve vested interests!!! 2.Municipal Solid Waste disposal: In my earlier mail to MoEF I brought to the notice of MoEF the in action of APPCB in Municipal Solid Waste disposal. Now, somebody filed a PIL in the Andhra Pradesh High Court. Force committee of APPCB for several years. Media reports shockingly present the link between industry Ã”Ã‡Ã´ APPCB Ã”Ã‡Ã´ Institutions conducting studies. In Hyderabad the research Institutes Ã”Ã‡Ã´ Educational Institutes have bad reputation in this regard. I myself questioned many of them through my comments to state government in the past with reference to GO111, industrial pollution, etc. Another report on air pollution Vimta Lab submitted its report find little hazardous pollutants in the first report and in the final report it found significant pollutants that are health hazardous. In fact I myself brought to the notice of APPCB task force on several occasions on this. The details of these two reports clearly reflect that the report submitted by APPCB saying pollution levels have come down in Patancheruvu area is false. This is exactly what I presented in my mail given below. My appeal to Shri Jairam Ramesh, the Minister for Environment and Forests (with Independent charge), Sir please appoint an independent group involved in this area for the past several years to analyze the three reports, namely (1) Final Action Plan for improvement of Environmental parameters in critically polluted areas Ã”Ã‡Ã´ Patancheru-Bollaram cluster, Andhra Pradesh, prepared by APPCB; (2) Report submitted by Institute of Genetics and Hospital for Genetic Diseases of Osmania University to APPCB in 2010 based on a survey during 2006 to 2009; and (3) Report submitted by Vimtha Lab to APPCB on air pollution, and provide a realistic situation on pollution levels and health hazard levels for taking correct and appropriate decisions in the Patancheru Ã”Ã‡Ã´ Bollaram zones. I live in Angul,Odisha. This zone too is listed in the 10 most critically polluted zones of India, then why is it that you have not mentioned the same. It seems that CSE is bais about which corporate house to condem and which not too. You write about POSCO but when it comes to the ill deeds of Jindals, TATA, Vedanta etc. or the ill deeds of the Govt. of Odisha then why does your pen stop writing? Nice to see your concern on environment. This is what we must understand... Not only the Ministry or the pollution control boards, but the industries and ourselves too have to step forward. A blind run to the growth keeping the environment on margin could prove suicidal. The only option is a sustainable growth. I completely agree with your concern on Angul. Your awareness to the environment is a value addition to us. The story reflects the scenario of all the 43 critically polluted areas including 23 where moratorium is off. Vapi and Cuddalore are just two examples. Vapi is in the critically polluted list since 1989 and is the 2nd top most critically polluted area now where Cuddalore is just a new entrant in the list and was selected randomly. You can understand that to put the studies of all the 23 areas in a story is not possible... In fact this can be a good idea for a separate exclusive study. When you observe closely you will find that all these 23 areas have played similar cards. Similar cards to get rid off the moratorium. CSE has no agenda to condemn to a corporate house. You can screen through our efforts since beginning. Our effort is for environment & society and against its dirt/evil. And we believe that your concern on environment is right with us. Firstly I underestimated- there are approximately 15 areas still under development moritoria under CEPI. I do not have the citizens' right to use RTI but I have requested information about the putative mitigation plan for Korba. I would welcome information about access to this??? MoEF, on 5th July 2011, has relaxed two more critically polluted areas- Singrauli and IB valley, from moratorium. Now 18 areas are left with the moratorium ..or you can say.. are in process to be relieved. Here you get the action plan for Korba, the power hub of Chhattisgarh.. It will be interesting to you see your input on these. by colleting water samples and soil samples (as waste water is been used to cultivate grass, crops, and vegetables). ultimately finding their way into the Musi. The 18 km pipeline carring diluted effluent from paatancheru (CETP) is been discharging in the municipal sewer near kukatpally, but I wanted to know where exactly is that place in kukatpally sir. collection of water samples & soil samples for better results. As mentioned in my report about the CETPs effluents join the Amberper STP. A research carried out using the solid waste from the STP by an independent professor Saida from OU indicate that the waste contains health hazard metals beyond the limits such as Cadmium, chromium, nickel, etc. Limit 50 mg per kg but Cadmium and chromium present are 210 mg per kg. However, APPCB claims they are below the standard and expressed willing to analyse the same. The research result clearly reflect that CETPs are not treating the effluents properly and discharging in to drainage channels the partially treated effluents. This is what I expressed in my report. The state action plan is inadequately presented. The two maps [figs 1 & 2] are unreadable. That may well hide a paucity of relevant information but what is lacking is a scale. in order to assess what the state board/s are stating in terms of mitigation it is necessary to see where existing and planned power plants and smelter are sited- and where existing and planned monitoring points [air and water] are [to be] sited. A larger scale map is necessary to evaluate this. On CPCB-CEPB webiste I note that they record annual ambient AQ measurements at three sites- [ambient to]where these are is unclear, although they could usefully be on the action plan map! clearly states that there must be more rigorous AQ monitoring and assessment- for more than just SO2 and SPM. NOX is confused with NO2 in the above AQ data. There is no indication of the default conversion rate. With regard to AQA I have no basic meteorologicqal data. Have DTE any contacts at the IMD at the GOI Ministry of Earth Sciences? I note that IMD specify four seasons as having different meteorological conditions, but the state board have some basic AQ historic data for July [but not likely to be during monsoon] and January . I am writing an assessment of the inadequacy of action plan responses to CEPI- including the need to assess groundwater around the ash and red mud ponds, and the need to take effective action on the securing the river and its three nallahs. Additionally I have a critique of the planned burning of hazardous waste in the cement plant. Can DTE write to CPCB and the state board requesting better mapping? and perhaps indicating that a critical response is coming? I note that the recent MOEF clearance for two new Hasdeo Anand coalmines are likely to affect a northern tributary of the Hasdeo river. but accessing is a difficult task. Follow-on story of "Dirty Forever". Our earlier study published in July 15, 2011 DTE (above)proved true. Very interesting to read. Thanks for all these informative comments. Keep up this work.